The ice lakes of Arjeplog have seen it all. Jaguar and Land Rover have been coming here for the past 30 years: long enough to recall a time when their test site at the lake called Revi had no modern, multi-bay facility, but just the landowner’s garage. But there has always been all the space in the world to play in. During that time, the Lapland ice has frozen, thawed and refrozen while an evolution of saloons and sports cars has been discharged from the distant gates of Gaydon and Solihull. But never before has it seen anything like the F-Pace. 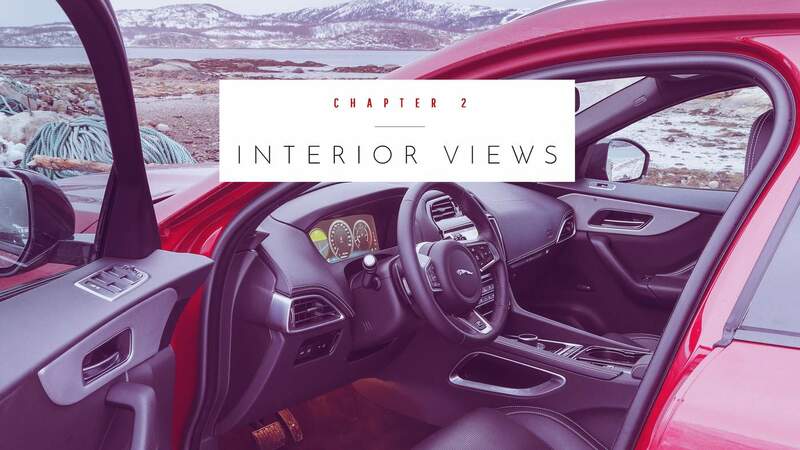 The industry’s showroom is now more diverse than ever before, and the crossover has emerged as the latest tipple of discerning choice: sexier and faster than a 4x4; more practical, robust and usable than a saloon; and with an image that’s as imposing on the imagination as it is on the road. It has, in what seems like no time at all, become vital to any premium manufacturer’s profitability. So it was always a case of when, not if, Jaguar would make the watershed decision to attract a broader customer base. Yet this has required some hand-wringing. There have been questions of ethos, of similarities to its partner’s range, and of a close rival. The latter arrived only recently; the exceptional Porsche Macan landing so forcefully that Jaguar briefly halted the F-Pace’s development to reassess where it was going. Jaguar freely admits that having the Macan as a benchmark helped it make a better car. 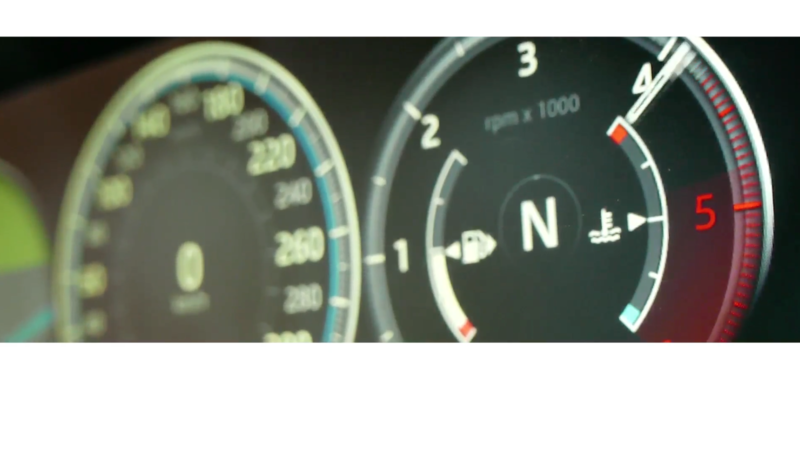 But having the right barometer, the right idea and the right segment does not necessarily make the right car. 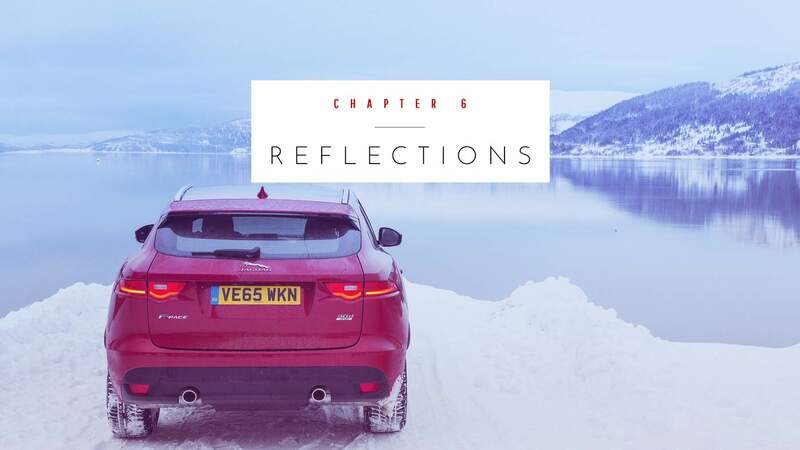 As the firm’s first attempt at a vehicle outside its low-slung comfort zone, it is critical that the product still looks, feels, drives and rewards as we’d imagine such a Jaguar might. 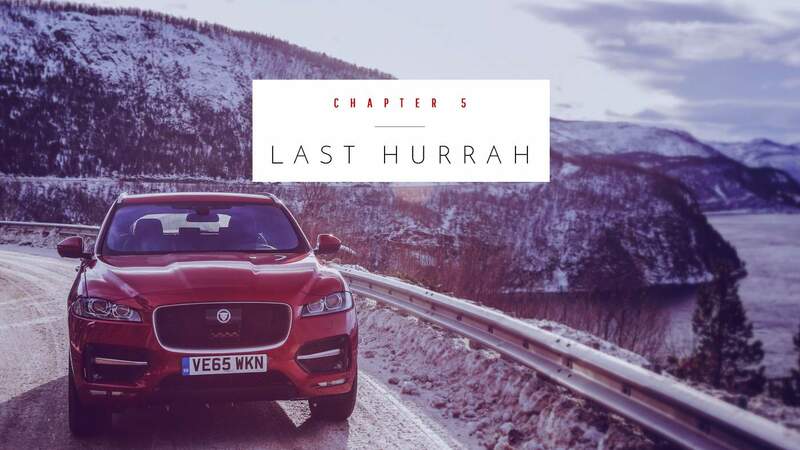 The end of the F-Pace’s development journey at Arjeplog is the start of ours. The plan is simple: to drive the car from here, in the middle of Sweden, into the Arctic Circle and onwards to the Norwegian town of Mo i Rana, before heading to Bodø airport for our flight home. 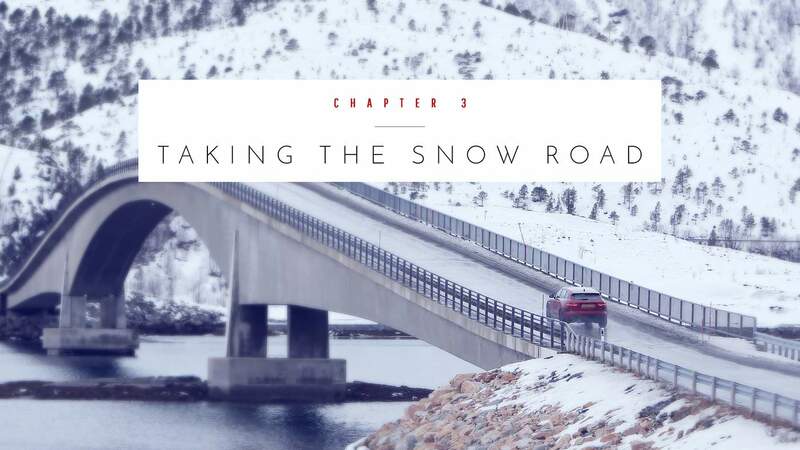 That’s almost 500km of crisp, exquisite and mildly treacherous Scandinavian highway. The first day starts early. Sunlight is at a premium: it doesn’t properly appear till almost 8am and will be dying by 3pm. So while we’ve got to travel only 272km today, there is still the usual requirement from photographer Stan and James the cameraman to get cracking. This being a JLR-sponsored trip, nothing can be left to chance. There are two support cars: a Discovery Sport driven by Jaguar’s PR maestro Jon and Land Rover Experience driver Marvin, plus a full-size Discovery wearing a heavy-duty winch and the kind of roof-mounted lighting rig you might use to warn a ship of approaching cliffs. 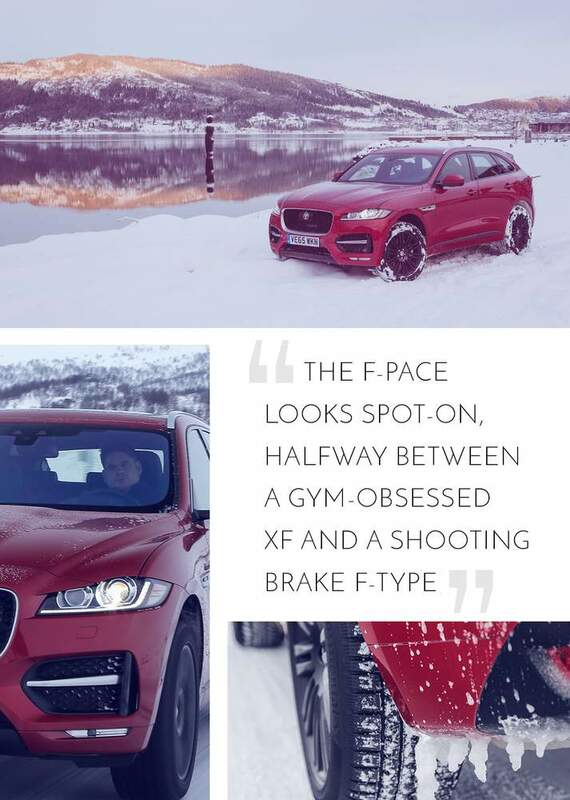 There’s a wealth of practicality inside, too, in the form of Rob, a fitter at the end of his three-week shift at Arjeplog, and Matt, a JLR employee who manages the track at Revi. 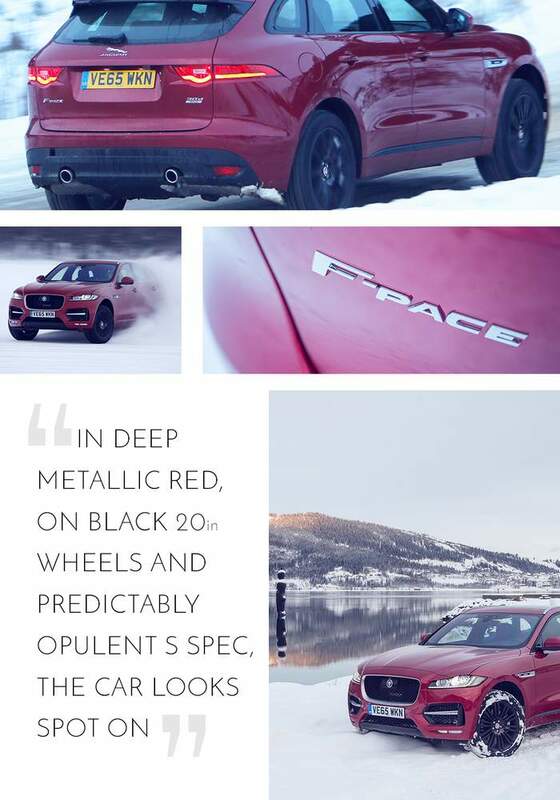 Of all the things Stan wants in Sweden, number one is a set of pictures of an F-Pace driving on a frozen lake. For glamour, Revi doesn’t hold a candle to JLR’s other test facilities at Nardo and the ’Ring; yet its blank, windswept canvas, broken up by the never-setting sun every summer and spotlessly re-layed with the arrival of autumn, is quite a location to meet a car I’ve only seen before under motor show lights. The potential here is for the pretty F-Pace to topple from its pedestal and look awkward off-road, especially next to a serious 4x4. It doesn’t. In deep metallic red, on black 20in wheels and in opulent S spec, the car looks spot-on, halfway between a gym-obsessed XF and a shooting brake F-Type. Additional height is obviously its most noticeable feature, although the XF-style windscreen and bespoke rear end are so suggestively raked that the F-Pace never seems anything less than squat. On Revi’s vast skidpan, the F-Pace looks no less at home in the powdery detonation cord-style eruption of a four-wheel drift either. I’ve seen a Porsche Cayenne, also blessed with a rear bias all-wheel drive system, do the same on snow and ice, yet it never looks athletic in the process. 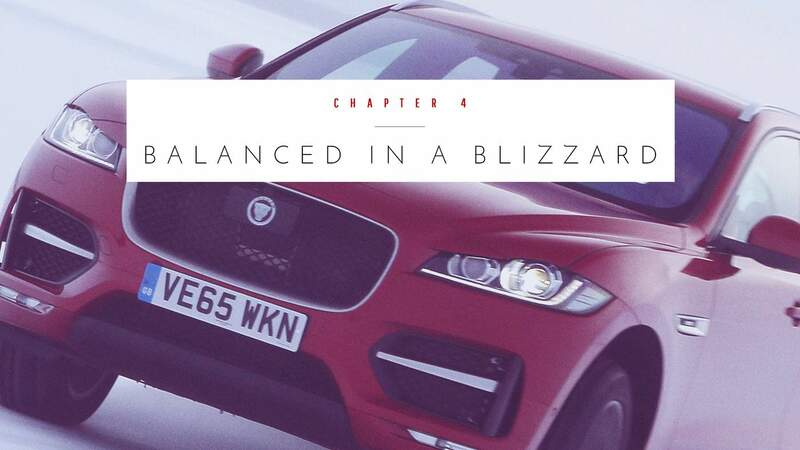 The F-Pace does. Before we set off, the JLR lads insist on hosing the compacted snow from the car’s tyres, to prevent the noise it creates at speed from driving us to distraction. I notice the F-Pace is shod only in its optional winter rubber, not the full-on studs which both Discoverys are wearing – a fact that strikes me as a fairly prodigious statement of faith in the hardware, given our northerly destination. If there’s a hint of envy about being aboard a Land Rover for the journey, it evaporates when the three of us climb into the Jaguar. 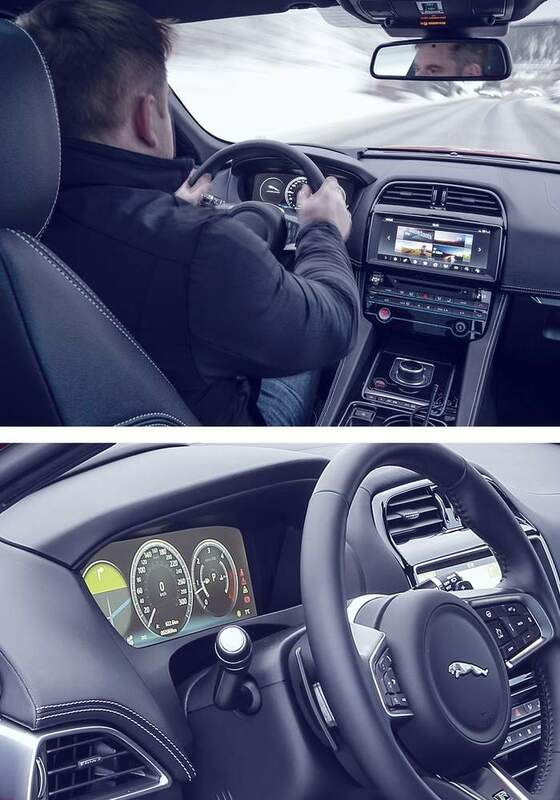 While the exterior may share much with the XF (not to mention the aluminium platform under the skin), the dashboard architecture is almost a direct carry-over of the XE’s. It is all viewed from higher up than in the saloons – although not too high. Jaguar doesn’t wish to replicate Land Rover’s command perch; better you feel snug and zoned in. With the interior’s waistline tucked under my arm, and the roof not far away, the F-Pace feels car-like yet burly, too. It’s agreeably roomy, though. Even before we reach the main road, the F-Pace proves one of its crucial characteristics: it accommodates three men, their luggage and a load of camera and video gear, as well as a load of other clobber. Over the journey I didn’t hear a single complaint about the amount of space on offer. We set off on route 95 in the Swedish national network; the fairly straight, single-carriageway road passes straight through the centre of Arjeplog village. The 95 will carry us through the lower fringes of the Arctic Circle and across into Norway. The Swedes do not grit their roads, trusting instead in their tyre choice and driving skills. 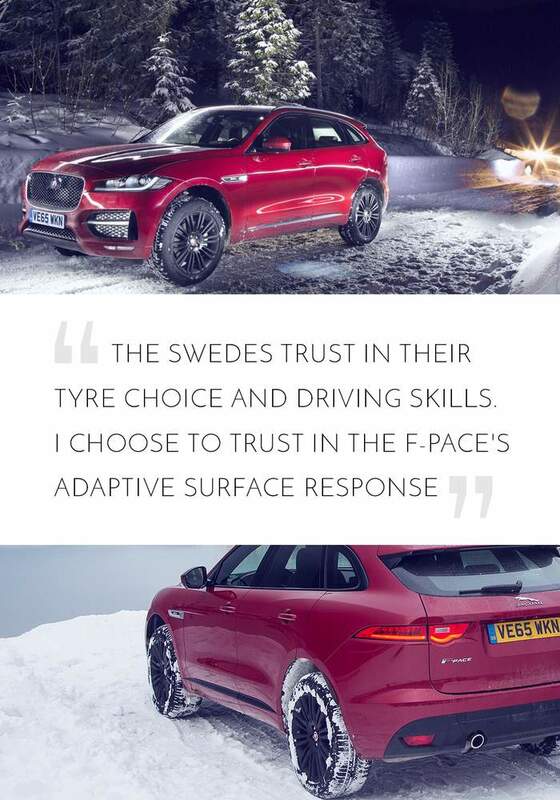 I choose to trust in the F-Pace’s Adaptive Surface Response button, which constantly measures the grip under each contact patch, and adapts the throttle response, stability control and all-wheel drive system to suit. The car’s auto-juggle of its many dynamic features is comforting, not least because with the 3.0-litre V6 diesel up front there’s 516lb ft of torque to share between the axles, and there will be no clear Tarmac now until we reach a tunnel in Norway long after dark. 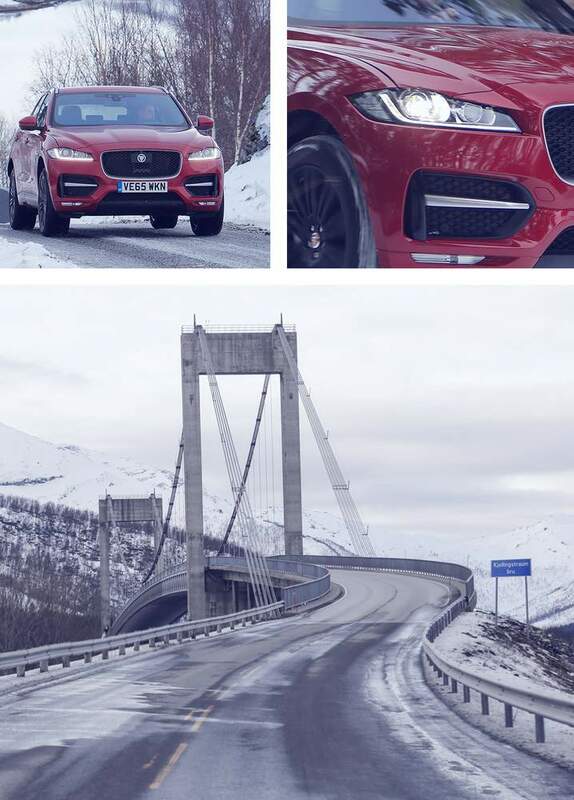 For now, though, all is calm in the F-Pace and it has a seemingly unshakeable grip on the long sections of route 95, so that even from behind the wheel I can watch the conveyor belt of impeccable beauty all the way to the village of Lillviken, where Stan leaps from the car to snap the first Arctic Circle sign we come to. The rest of us decamp into the adjoining shop that marks the spot. It stocks the predictable tourist tat that we’re not interested in, and the crisps and chocolate and pop that we very much are. It also has a toilet and a sleeping husky dog, which ticks further boxes. Moments later, we hit Norway, our border crossing marked – as is traditional in most of continental Europe now – by a small blue sign and a feeble, unmanned barrier. Either could easily be missed, but the first dirty snow in more than 130km cannot: evidently, the Norwegians grit some of their highways. The road itself changes, too, and not just in name, as we pass to the Nordic 77. We now encounter more serious bends and a good deal more forest as our journey winds its way towards the E6, Norway’s very long equivalent of the M1. While the southern end of the E6 is a proper motorway, the northern part that we’re on is a single carriageway with views rather more spectacular than its UK counterpart’s. We are still in the Arctic Circle – and, boy, do we get reminded of it. As we pass the Saltfjellet mountain range, the weather summons up a cinematic Nor’easter of driving snow and white swirl. Visibility shrinks to a matter of feet; enough for us to occasionally lose sight of the lorry in front which has been holding us up. Were it not for the pale glow of tail-lights and the chest-high red plastic poles strung along the verge, it would be impossible to distinguish road from scenery. Thankfully, the blizzard clears and we soldier on undeterred. The rate of our progress has slackened, however. 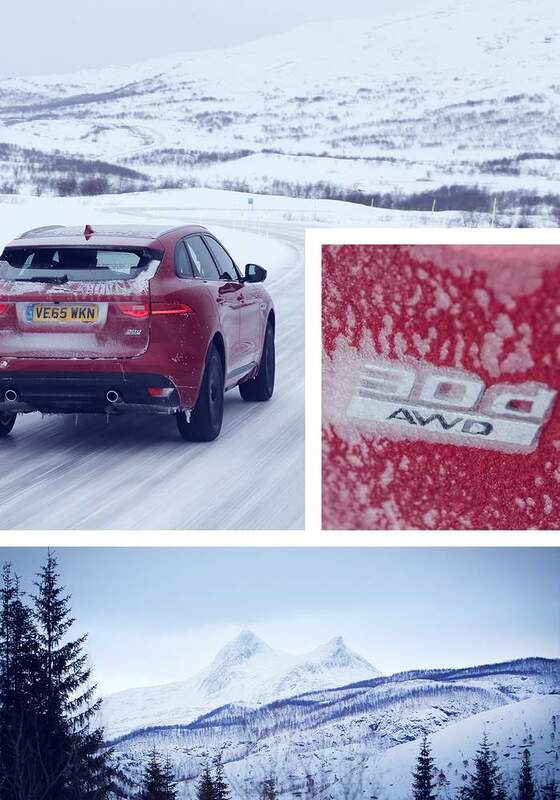 As Norway’s trunk road remains twisty, the F-Pace’s tyres have a tougher time gaining purchase on the slushy meringue of compacted snow and ice. Fortunately, at just the right moment, the driver of a battered Volkswagen Caravelle, who seems to have a rally co-driver’s knowledge of the road, pulls out in front of us. This is useful because a) it’s easier to follow his line and speed as he takes the E6’s unfamiliar corners, and b) it’s a timely reminder (for a driver better used to high-friction surfaces) that a modest degree of slip angle isn’t anything to be concerned about, especially in a car with the innate balance, cool-headed throttle response and expertly-tuned stability aids of the F-Pace. After an overnight halt in Mo i Rana, nestled at the head of Ranfjorden fjord, we’re up early the next day. We’d planned to leave immediately, but Stan’s bedtime reading of the pertinent Wikipedia page has revealed there to be – of all things – an Antony Gormley sculpture in the bay, and he wants a picture of it. The solid granite Havmann (the Man from the Sea) is an 11m black figure submerged to its knees in the Ranfjorden. Soon others will enjoy his view: the lucky occupants of a smart new steel-and-glass apartment building being constructed behind us. Stan snaps the F-Pace facing out to sea like the Havmann – but it will be against backdrops like the new building that this newest Jaguar will most often be admired. Today, though, we’re not long for the town. We plough north until we meet the Skjerstadfjorden. As the road climbs away from industrial areas to meet highway 80, the fjord-filled scenery becomes more and more spectacular. We divert down the FV17, a smaller road which runs all the way up this part of Norway’s rugged coast, leapfrogging the water with a combination of suspension bridges and small ferries. Despite being further north, the main road is almost ice-free and for the first time the F-Pace pulls effortlessly away from the Discoverys behind. Switching out of Surface Response mode at last, the F-Pace hunkers onto the cold black Tarmac then proceeds to hoover it up like a beefed-up XF, with all the same poise and pedigree. Gratifyingly meaty in both steering feel and footprint, the car carries us towards the waters of Sundsfjord. Away from the main road F-Pace is given the opportunity to prove itself on sheet ice (it passed: a tribute to the Low Grip Launch system) as we inch it as close as possible to the vast millpond for the final shot. It is soul-stirringly beautiful here, the strong currents of the Skjerstadfjorden replaced with waters of sub-zero stillness and the surreal effect of sky almost perfectly mirrored at the shoreline. Time, too, for me to reflect. Only two questions really require answering. One is the traditional road tester yardstick: would you, given the choice, drive this particular car past the airport and all its tedious, sweaty convenience, and keep driving until you see your front door? Easy. The big-engined F-Pace has all of the prerequisite comfort, pace and pleasantness to make an additional day-and-a-half at its wheel seem easily preferable to seats 8E and 15B on the two flights required to get me to Heathrow. 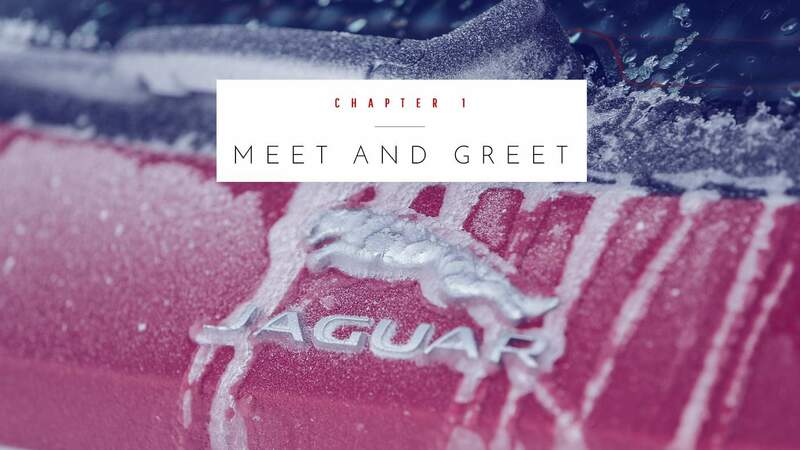 The second question: which car would I have chosen over the Jaguar for our road trip? Nothing from the manufacturer’s own range, certainly. 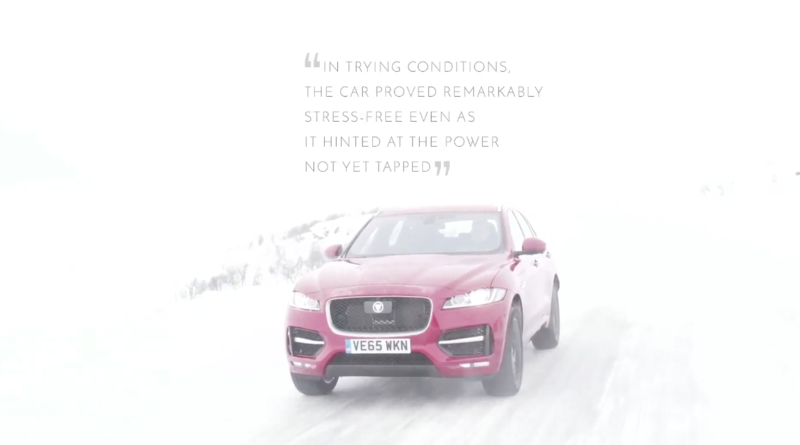 The F-Pace’s re-engineered all-wheel drive system and electronic slippery surface gubbins were a must, and are replicated nowhere else. A Land Rover? Possibly. However, there’s nothing there as light or as nimble as the F-Pace to relish driving more briskly when the Tarmac finally comes good. A Porsche Macan? Well, that’s the million-dollar one, isn’t it? It’s one we’ll spend the ensuing weeks and months answering properly; but, for me, at the tail-end of a long first drive of the car, it’s an emphatic no. No way, in fact. 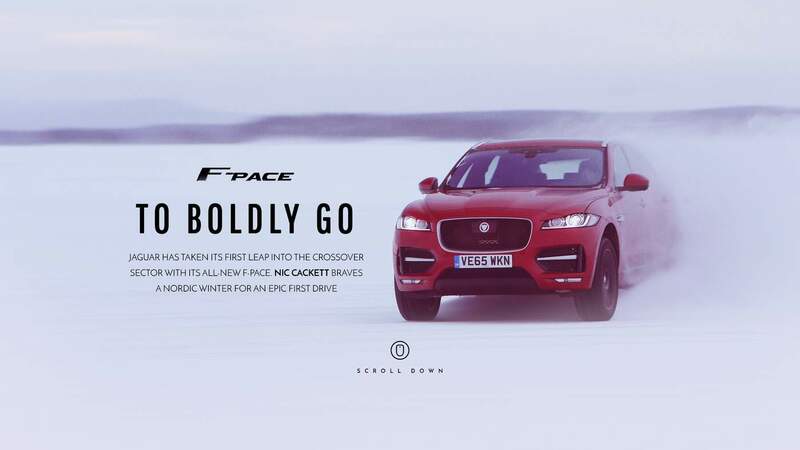 The F-Pace is more relaxed and more easily approachable; in trying conditions, it proved remarkably stress-free even as it furtively hinted at the potency, power and handling prestige not yet tapped. A true Jaguar, then – only tantalisingly more so.